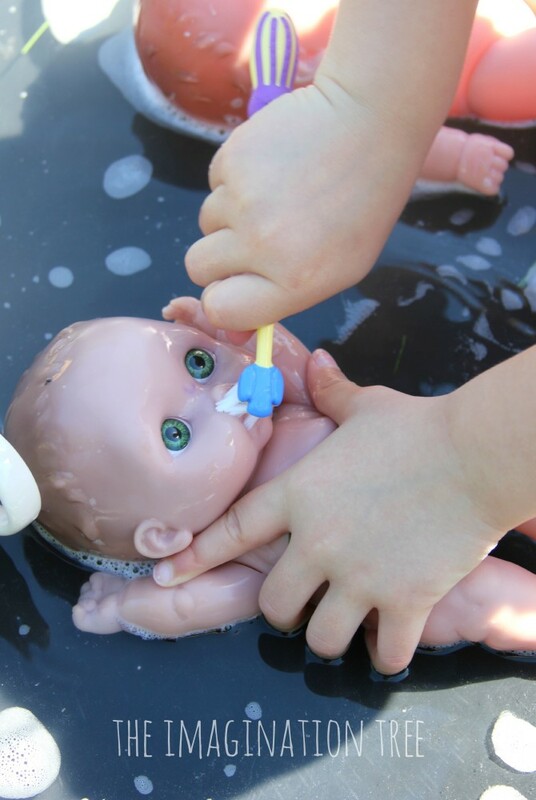 Set up this fun baby doll washing activity for toddlers and preschoolers to enjoy. 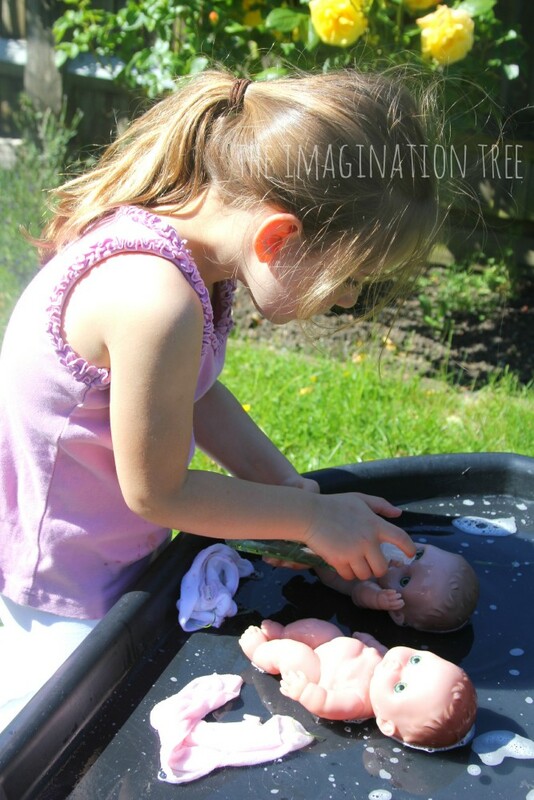 Great role play activity for developing personal, social and emotional skills as well as being a fun water play activity for outside! 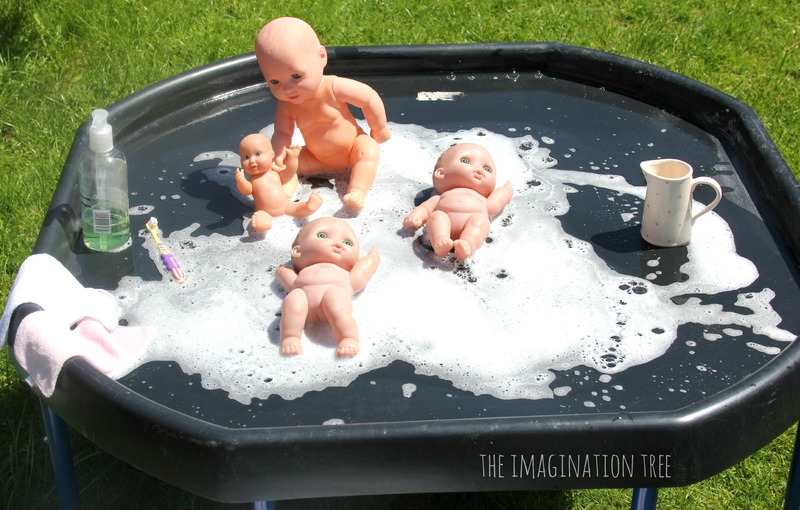 When I was teaching Reception (Kindergarten) this baby doll washing activity was always an absolute favourite with the children when we set it up in our outdoor play area. 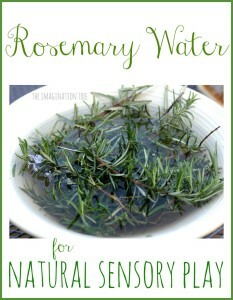 My own children now love it too and it has become a regular staple during the summer months in particular. 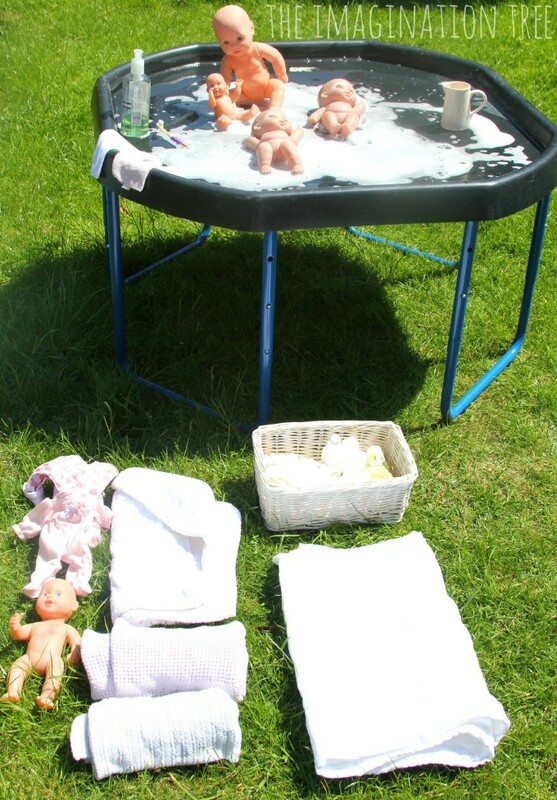 We used our Tuff Spot (builder’s mixing tray) sensory table as the baby doll washing station, although any type of wide, shallow sensory tray or water table would work. 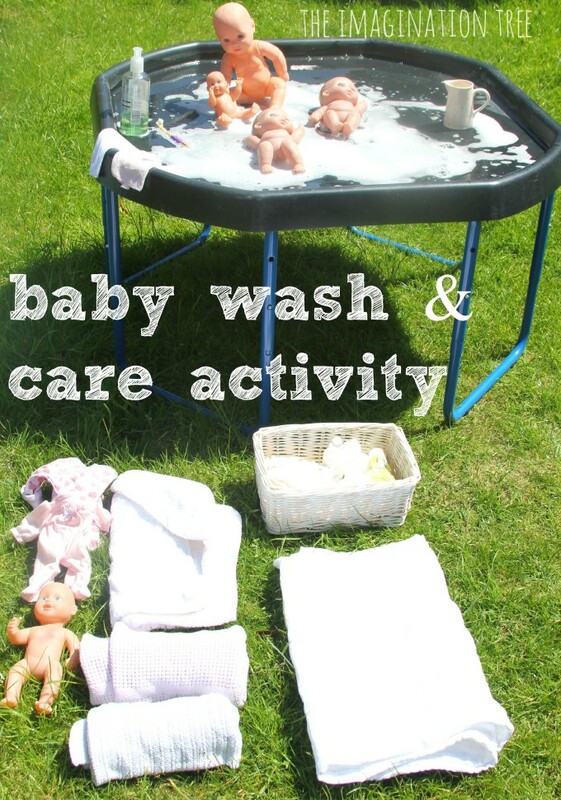 You could, of course, use an old baby bath or washing up bowl too; those would be perfect for a smaller scale version of the activity! Into the tray we put a variety of waterproof baby dolls, some warm soapy water, bubbly wash in a pump bottle, a small jug for scooping water, baby flannels and some toothbrushes. On the floor nearby we had some muslins, baby hooded towels, blankets, cotton balls, natural Kamilosan chamomile lotion, cloth nappies (diapers) and some newborn size baby clothes. Side-note: it’s SO much cheaper to buy some newborn or tiny baby sized real baby clothes than the ridiculously overpriced dolls clothes they sell. Having left over baby clothes and equipment in the attic is even easier! 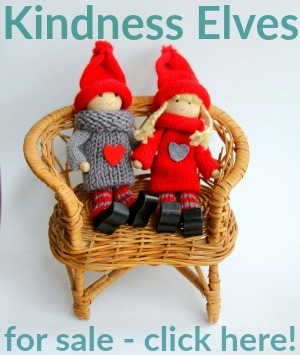 If you’re doing this for your classroom or daycare, try asking the parents if they have items to donate. Teeth brushing was a good opportunity for talking about dental care and hygiene and would make a good class activity after discussions in circle time too, as well as overall good care and hygiene of our bodies. We also talked about the importance of keeping the babies warm and drying them carefully, before dressing them. 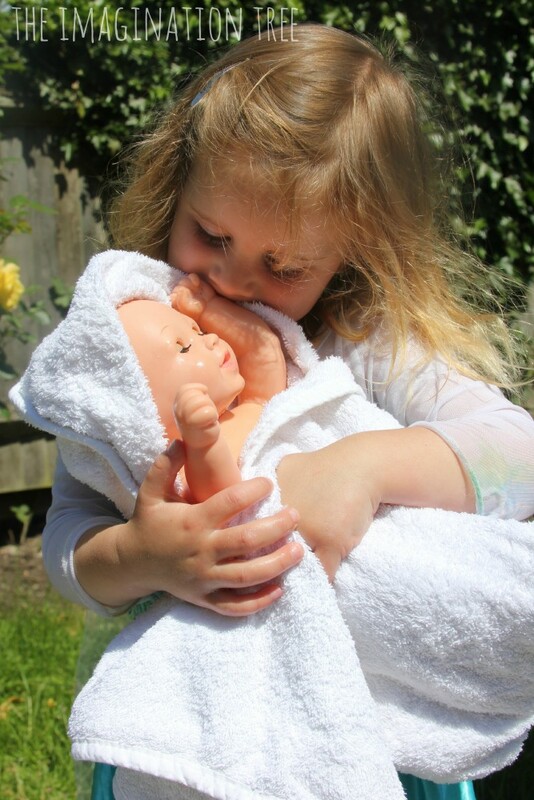 There were many lovely moments of PSED (personal, Social and Emotional Development) observed, with lots of gentleness as well as shushing, rocking, cuddling and singing to the dolls. They really enjoyed putting the cream and nappies on and I couldn’t get over the cuteness of those tiny gNappies/ gDiapers as they fit almost perfectly! 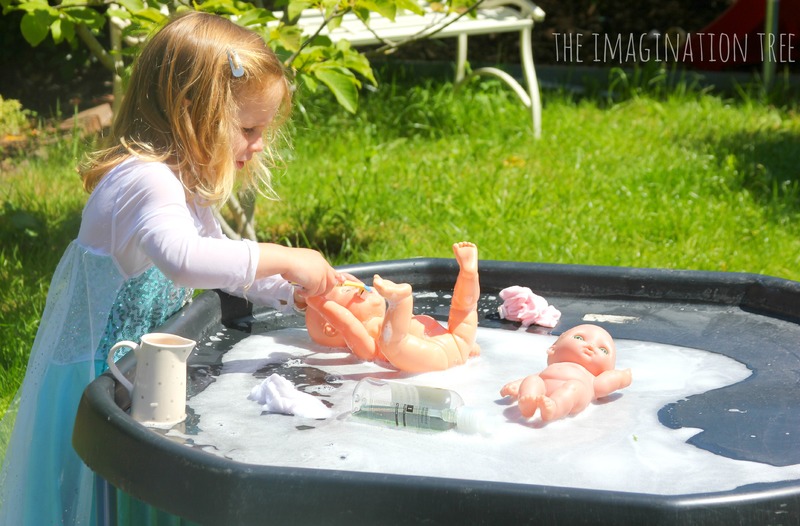 Apart from all of the caring and role-playing fun, this is also such a lovely activity for hot days, keeping cool and having a bit of a splash while they play! 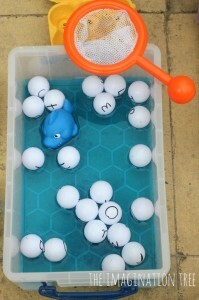 See all our WATER PLAY activities. See all our ROLE PLAY activities. Follow our SUMMER FUN pinterest board for loads more ideas from around the web. 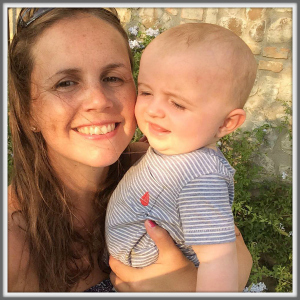 Follow Anna @ The Imagination Tree’s board Summer Fun Activities! on Pinterest.